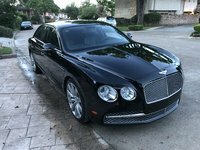 CarGurus has 100 nationwide Mulsanne listings starting at $88,888. The luxurious trademarks are obvious on the 2014 Bentley Mulsanne—prominent grille, stretched profile, elegant lines that curve and straighten at all the proper places. But Bentley's sumptuous 4-door flagship does contain some new features that are hidden to the eye. The classic sedan can now handle an avalanche of modern technology thanks to a WiFi router with a high-speed Universal Mobile Telecommunications System phone module and SIM card reader, all located in the glovebox, that transform the cabin into a WiFi hot spot that can accommodate up to 8 devices at once. The available Entertainment Specification has been upgraded for 2014 and provides two rear trays that unfold from the front seats to reveal hide-trimmed writing surfaces, and with the touch of a button they reveal even more. Beneath the hide surface are twin iPads and wireless keyboards that charge when stored and the car is running. Two 8-inch LCD headrest screens with a 20GB hard drive and DVD players are also included in the Entertainment Specification. The Mulsanne's Comfort Specification has been enhanced for 2014 as well. It now offers headrests that can adjust higher and lower than the standard equipment, as well as adjustable seat bolsters to further maximize comfort. There are also new footrests for the rear seats that are trimmed in the same carpet as the cabin and can be stowed under the front seats when not in use. Privacy curtains, instead of the standard shades, also debut in 2014 as part of the Comfort Specification, as do seat cushions filled with duck down feathers and upholstered with the same leather as the seats. The Mulsanne is powered by a twin-turbocharged V8 that produces 505 hp and a massive 752 lb-ft of torque, which the EPA estimates will get 11 mpg city/18 highway. That engine is mated to an 8-speed automatic transmission with electronic shift interface that sends power to the rear wheels. The multilink rear suspension has been specially developed to handle all the V8's torque. The Mulsanne's ride is made even smoother by electronically controlled air springs with Continuous Damping Control (CDC) and a Drive Dynamics Control that allows the driver to switch the CDC and power steering between 4 settings: Bentley, Sport, Comfort and Custom. The Mulsanne's interior delivers unadulterated luxury. There's a continuous “Ring of Wood” from front to rear, a choice of 24 standard colors in single or two-tone leather upholstery, pure wool Wilton-weave floor mats, a hand-stitched leather steering-wheel cover, a choice of 22 seatbelt colors, polished stainless steel fittings, glass switchgear, 4-zone air conditioning, 14-way adjustable seats with memory and heating, 8-way adjustable rear seats with memory and heating, rain-sensing windscreen wipers, tinted glass sunroof—and those are only some of the highlights. Standard infotainment features include an 8-inch high-resolution display that hides behind a veneered panel when not in use, multimedia rotary controller and redundant voice control for all major systems, hard-disc satellite navigation, 14-speaker audio system with digital sound processing and 2 subwoofers, full iPod and MP3 player compatibility including video playback, Bluetooth and digital or satellite radio, depending on the market. Weighing in at 7,055 pounds, the Mulsanne certainly feels safe. It complements that feel with a full array of safety features that include electronic stability control, traction control, hydraulic brake assist, electronic brake prefill, automatic hill-hold control, electronic brakeforce distribution, intelligent driver's and front passenger airbags, head and thorax airbags for front and rear, tire pressure monitor with speed-related warnings, and vehicle immobilizer and interior volumetric alarm system. 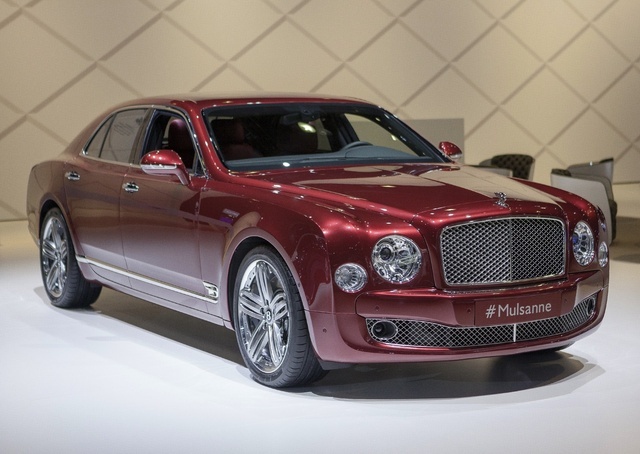 What's your take on the 2014 Bentley Mulsanne? Have you driven a 2014 Bentley Mulsanne?